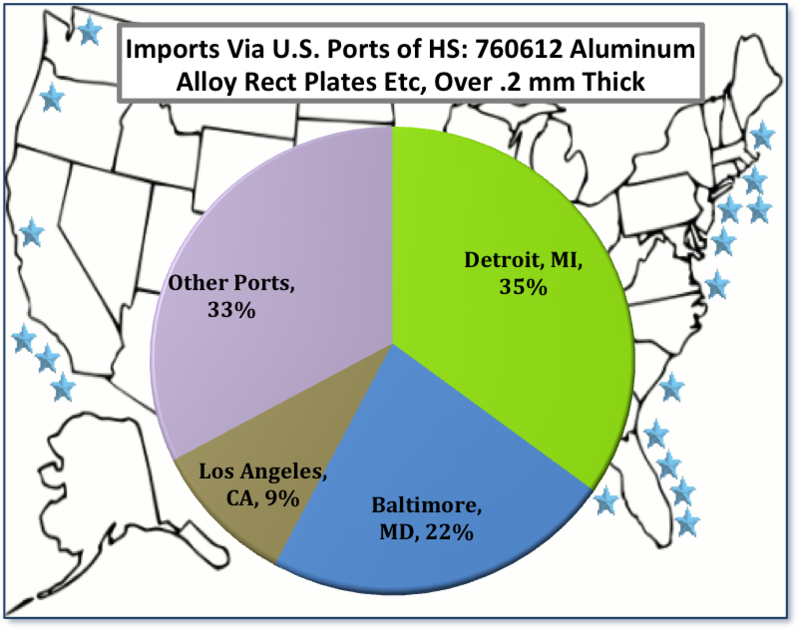 The following report will summarize the top U.S. suppliers, methods of transport, receiving ports and destination states for HS 760612 ALUMINUM ALLOY PLATES. Furthermore, historical import trends, global market size, and product hierarchy will provide contextual understanding. U.S. Customs data can provide transactional details on about 80 -85% of the waterborne imports of this product. 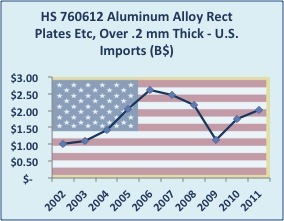 Information about the foreign suppliers and U.S. importers of HS 760612 ALUMINUM ALLOY PLATES as well as many logistical details are assimilated on a daily basis. Contact us for purchasing options. 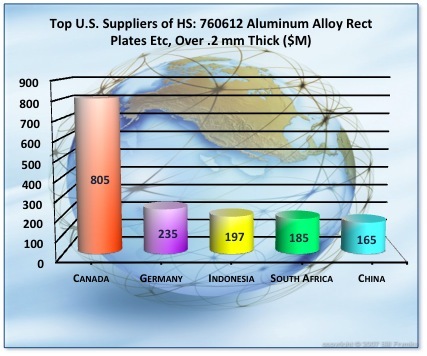 HS 760612 ALUMINUM ALLOY PLATES: Top five U.S. suppliers. 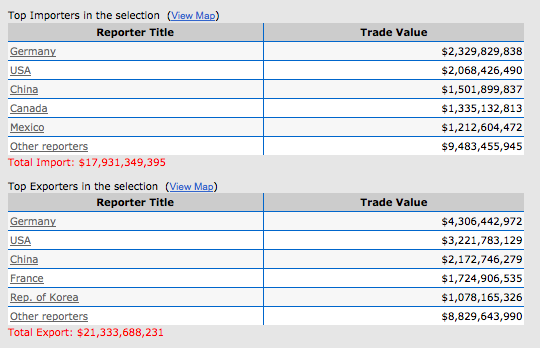 USD million in imports. 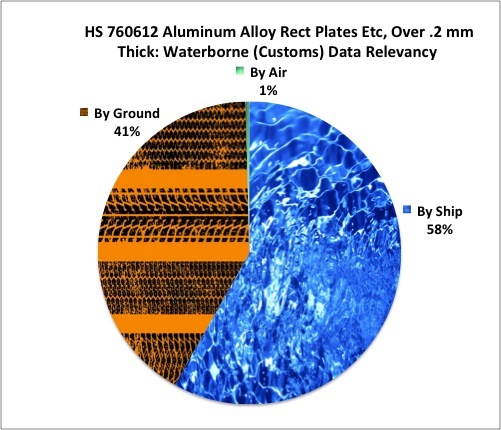 HS 760612 ALUMINUM ALLOY PLATES; method of transport. Note the waterborne (ship) percentage. 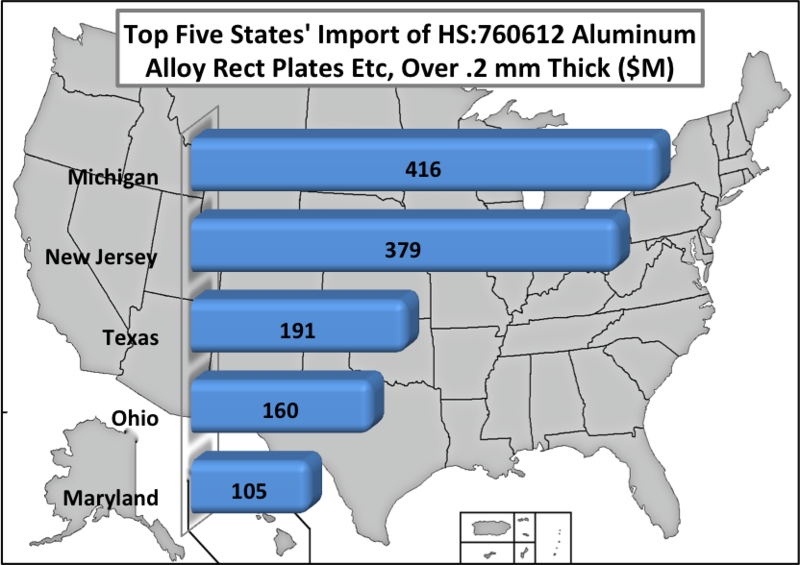 Top five U.S. destination states for imports of HS 760612 ALUMINUM ALLOY PLATESin USD million. U.S. Waterborne Import Trade (WIT) Report. HS Code: 760612 ALUMINUM ALLOY PLATES©WorldTradeDaily.com® All rights reserved. Robert Thompson, Editor-in-Chief. Louisa Avery, Editor. Isaac Thompson, Research Writer.